"White Supremacy" - A Dangerous Joke On The Rise. You are here: Home / Weekly Columns / Opinion / “White Supremacy” – A Dangerous Joke On The Rise. “White Supremacy” – A Dangerous Joke On The Rise. 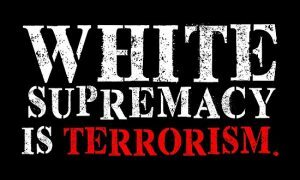 (ThyBlackMan.com) From a small African-American church to a New Zealand shooting to mass murder after mass murder all done by “white” active shooters, ignorance abounds and they seem to be losing their minds. Or maybe this country is imploding in on itself because what goes around comes around. Either way, whether they are killing others or their own, “white” nationalism is on the rise. But one thing is for sure. Such primal, hateful, misguided and primitive behavior is anything but supremacy – quite the opposite. The only reason “white supremacy” has even taken root as an ideology is because they came to this land with that attitude as they invaded territory that never belonged to them. They found that oppressing, enslaving, betraying and murdering others made them feel good about themselves. So the invaders got away with what they could not get away with in England. And the “founding fathers” of America barely survived by the skin of their teeth. If they had lost the war against the British, they would have been hung as traitors. This is the history and the foundational poison seed you don’t read about in the history books. So yes chickens come home to roost, the boomerang returns and everything done in the dark comes to the light. But are they supreme or superior? No. That is an illusion perpetrated by people who created new sets of rules in the land they invaded – rules which make it easier for them and harder for everybody else, thus giving the appearance of supremacy or superiority. Donald Trump alone can disprove “white supremacy” all by himself. Any person, group or people which is in fear of natural selection for extinction is not superior. And yes its coming. Any group that attempts to lift itself up by tearing down, destroying and fearing another group of people is not supreme. Any group or people which cannot maintain its own existence without violence and destruction is primitive, insecure and destined for the very extinction it wishes to avoid. This is the hard. cold truth – like it or not. So what we see on the rise is “white” ignorance, violence, insecurity and destruction – nothing more. Not supremacy, not nationalism, not superiority. Just plain old trailer park ignorance with labels to hide the truth. But in the words taken from the movie Terminator, “a storm is coming”. Ironically a type of non-religious, evolutionary and genetic judgment day that cannot be stopped by false flags, “white” trash, “white” power or racism. Yes a storm is coming. The year 2016 was the first time in our modern history that more “white” people died in America than were born. And the Census Bureau has projected that soon Caucasians will become the minority in America. That means loss of the majority and being outnumbered means an inevitable loss of both political and economic power. It’s just a matter of time because a storm is coming. This is why so many Caucasian people fear Muslims and Hispanics. Both groups are reproducing at a faster rate than “white” America. Furthermore young people of all ethnicities or nationalities are blending together, marrying and having children together. this is stamping out racism one family, neighborhood or community at a time. And when you blend any other ethnic group with Caucasian America, the “white” trait soon becomes recessive. As a matter of fact, it is only a matter of time before “white” disappears in America as the trait is consumed within other races or ethnic groups. And I reiterate that it seems evolution has targeted the “white” trait for extinction or assimilation in America. Boo hoo! But then again what goes around comes around and they were neither the first humans on this planet nor in this land in the first place. Is this Cosmic, evolutionary justice? Maybe. So Jed and Becky you can shoot your guns, spew your hate rhetoric and drive your rebel flag covered pickup trucks all day long. Then your political counterparts can put on suits instead of white sheets and ride in limos instead of on horses. But none of the above will stop the evolutionary storm that is coming. These are the facts and no amount of ropes on trees or walls across stolen lands can stop the boomerang of evolution. That is about the extent of it. It is sad that all of this comes about because white racists are and always have been afraid of people of colour and the fact that all of us stem from one original race out of Africa. I’m white and I’m not afraid.